Every social network worth its salt now supports videos. It’s estimated that by 2019, 80% of the world’s Internet traffic will be used in watching videos. If you want people to pay attention to you on Facebook or other social profiles, you’d better learn the tricks to upload perfect videos. 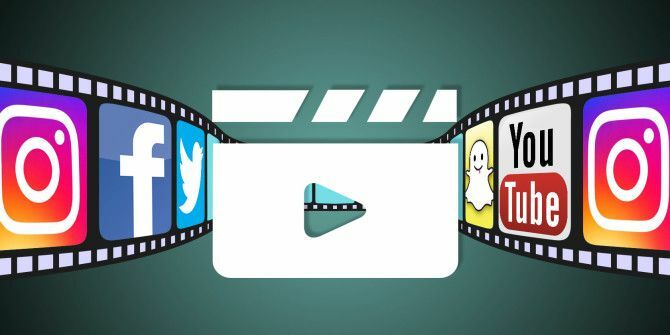 The biggest mistake you can make is to upload the same video on Facebook, Twitter, YouTube, Instagram, and Snapchat by using a mass uploader like Buffer Video Buffer Takes Social Media Scheduling To The Next Level With Video Buffer Takes Social Media Scheduling To The Next Level With Video If you are a social media junkie, who likes to post ten times a day, then the tool you must have on your computer is Buffer. And Buffer now does video. Read More . What draws eyeballs on Twitter might not get anyone interested on YouTube. Like with anything else, you need to customize content for every type of audience. No, you shouldn’t link your YouTube video in the description. If you’re posting on Facebook, then upload the video on Facebook. It makes a big difference. If you found a great video on Facebook and want to share it with your Twitter friends, then download the video from Facebook How to Save Videos From Facebook: 7 Methods That Work How to Save Videos From Facebook: 7 Methods That Work Is your internet connection unstable? Here's how to save videos from Facebook so you can watch them offline and on demand. Read More and upload it separately to Twitter. It’s a small step, but it matters! Each service has some restrictions on what you can and can’t do with videos. These might be in the maximum length of a video, the file size, the file formats, and much more. Here’s what you need to know. *Facebook supports most file formats. **YouTube requires you to verify your account for uploads longer than 15 minutes or larger than 20GB. In case you don’t have the right video, there are free tools to convert any file format online How to Convert Any File Format Online with Free Tools How to Convert Any File Format Online with Free Tools If you need to convert a file, here's the ultimate list of sites you should turn to. Read More . It’ll take you a few seconds to get the right video ready. Knowing the restrictions is only half the battle. Just because you can upload two hours of video on Facebook doesn’t mean you should. The audience has a finite attention span and you need to know their sweet spots to capture it. Internet audiences have a lot of content to consume so they generally reward brevity. In short, if you can make your video shorter, then make it shorter. If you’re wondering about the “sweet spot”, then it doesn’t necessarily have to do with the social network as much as the topic. The network it’s being shared on only indicates the audience’s expectations. Leveraging TheNextWeb’s research in two articles on optimizing videos, Buffer’s analysis of videos and Facebook particularly, ReelSEO’s study of Buzzfeed, Iconosquare’s deep look at Instagram How to Get More Likes and Comments on Instagram, According to Science How to Get More Likes and Comments on Instagram, According to Science Read More , and other articles and studies on the Internet, we came up with a few guidelines. Facebook users look for bite-sized fun or “wow” moments that they can talk about without looking like an idiot, and generally watch videos of about 30 seconds to one minute. Lists, funny home videos, and anything related to food will get views. Shoot videos in landscape mode, i.e. horizontally. YouTube users look for some in-depth research, and generally watch videos of about three minutes. Explanations, demonstrations, and animations do the best. Shoot videos in landscape mode, i.e. horizontally. Twitter users look for information in a quick package, and will watch anything from 10 to 30 seconds. Go heavy with text and infographics, especially numbers or charts. Shoot videos in landscape or portrait mode. Instagram users look for cute, heart-warming, or inspirational topics. From fast-moving hyperlapse Fit More Into 15 Seconds With Instagram's New Hyperlapse Videos Fit More Into 15 Seconds With Instagram's New Hyperlapse Videos We live in an age of short-form content; say what you can in 140 characters, show what you see in 6 to 15 seconds. But there are always cheats and tricks, like Instagram's new app... Read More videos to cool edits, creativity is appreciated here. Shoot videos in portrait mode, i.e. vertically. Snapchat users look for for fun, personal videos. It’s not about the brand, it’s about the individual. In 10 seconds, do what you can. Shoot videos in portrait mode, i.e. vertically. Videos are auto-played on Facebook, so once it’s on someone’s screen, you have a short window before they scroll away. Hence, the first three seconds are crucial. Your visuals in the first three seconds should grab the viewer’s attention, and should feature noticeable movement so they know it’s a video and not a photograph. Get familiar with editing software and remember the basics of video editing How to Edit Videos Like a Pro: 8 Tips You Need to Master How to Edit Videos Like a Pro: 8 Tips You Need to Master If you're just getting into the editing game, you may be confused as to what to do with the many millions of clips you have... well, we're here to help. Read More . You need to trim the fat and get to the action right away. Yes, all major social networks auto-play their videos, but they are also muted at the same time. Apparently audio is seen as the big disturbance. The best sound for Facebook videos is silence, Wired says. For starters, you video’s beginning shouldn’t require the sound to be on. Remember that even if someone likes your video and chooses to unmute it, they’ll miss the first few seconds of audio. To be on the safe side, keep any crucial sounds or dialogues after the five second mark. And if possible, put in some subtitles in there. None of this means you need a completely silent video. Feel free to grab copyright-free music 14 Websites To Find Free Creative Commons Music 14 Websites To Find Free Creative Commons Music Do you use Creative Commons in any online project? When it comes to Creative Commons music -- there are certainly no shortage of websites with audio you can use for any occasion. Read More and add them to your footage, but just don’t use that to draw in viewers. While audio can’t be heard on autoplays, one thing will make your video stand out and grab eyeballs more than anything else: the thumbnail. Both Facebook and YouTube ask you to add custom thumbnails How To Add YouTube Thumbnail Images To Your Video Blog Post How To Add YouTube Thumbnail Images To Your Video Blog Post Read More , which will be noticed in any list where the video is featured, even if it isn’t autoplaying. For example, if a blog post has embedded a video, what you’ll see is the thumbnail with the “play” icon over it, so make it a great thumbnail. If possible, create and upload a custom one that features bold text teasing the video’s content, like Marie Forleo does above. Instagram, Twitter, and Snapchat don’t have any option to add a thumbnail and will instead choose the first frame. But hey, you can use that to your advantage too. Use a good video editor for Android or iPhone The 10 Best Video Editors for Android The 10 Best Video Editors for Android Looking for the best video editor for Android? Here are the best video editing apps for Android users. Read More and insert a slide of text at the start. In fact, you can get creative and design stunning text with Notegraphy Give Your Text Stunning Designs Easily With Notegraphy Give Your Text Stunning Designs Easily With Notegraphy Notegraphy makes it easy to create stylized snippets of text for yourself, or to share on social networks, and can also help you find interesting (and beautiful) snippets by others. Read More to add a little pizzaz. You could also try a trick Periscope users like to use 16 Periscope Tricks You Should Try Right Now 16 Periscope Tricks You Should Try Right Now It's easy to think of live-streaming apps like Periscope as simple press-the-button-and-stream processes, but a lot goes into getting noticed by the audience and making the result worth watching. Read More , and point the camera at a computer screen showing a well-designed thumbnail, or just start the video by showing people where you are before flipping the screen around. The one area where everyone is united and divided at the same time is the “Call to Action”, i.e. asking the viewer to do something else at the end of watching the video. Facebook has a dedicated “Call to Action” button, Twitter itself has talked about four different strategies that work, but no one has cracked the formula yet to define what call to action drives the most engagement. So let’s turn the focus to you. As a user of any of these social networks, what do you like to do after watching the video? Personally, I usually resume scrolling my timeline to see other things, so a call to action has never worked for me. Has it worked for you? And if it has, what call to action do you prefer? None of them really talk about that. In the end, their size limitations will almost always mean your bitrate goes down though. YouTube would be the only exception.